The Site of a settlement describes the physical nature of where it is located. Factors such as water supply, building materials, quality of soil, climate, shelter and defence were all considered when settlements were first established. For instance the site of Sydney, in Australia, initially took advantage of the excellent natural harbour and surrounding fertile farmland. Paris was established at a point where an island allowed an easier passage across the river Seine as well as providing defence, fishing, transport, and drinking water. There are a huge number of factors that have to be considered when trying to locate a new settlement. These can be grouped into four broad headings: climatic, economic, physical and traditional. The diagram below should give you an idea of how each one plays a part in the location of a settlement. Aspect and shelter are two of the most important factors that were used when deciding where to locate a settlement. Aspect relates to the direction in which the land faces. In the Northern Hemisphere the best slopes to locate on are those that face south, as they will receive the most sunshine, and therefore be best for agriculture. This can be seen clearly in many of the valleys of the Alps, where settlements have located on the south-facing slopes. Shelter is also very important, particularly from the cold northerly winds and prevailing south westerly winds in the UK. A good example of settlements being sheltered by their natural surroundings are the many spring-line settlements found along the base of the chalk escarpments of the North and South Downs. These settlements would also have benefited from the good water source and fertile farmland nearby. A supply of water was probably the single most important factor in deciding where a settlement might be located. Not only do rivers provide a source of clean drinking water, they also provided a food source through fishing, and a transport route. Most of the world's largest cities are located on rivers, especially the point at which they reach the sea, as this was often the first point that explorers landed. Water is vital to a settlement and is the most common factor behind their location. A dry point site is one that is slightly raised from the surrounding area, meaning that it is less likely to flood. Ely in Cambridgeshire is a good example of this. This refers to any site that has access to water, usually through being beside a river. Towns would either grow up along the river or clustered near the point at which the river enters the sea. Examples of wet point sites include the towns and villages of the Welsh valleys, which tend to extend along the flat valley floor, rather than up the steep valley sides. Spring line settlements in the North and South Downs are also good examples of wet point sites. 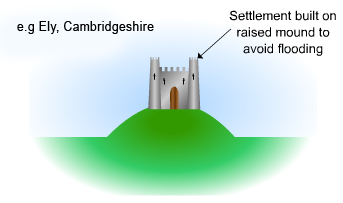 In medieval times defence was one of the most important factors influencing the site of a settlement. The relief (shape) of the land often proved to be the best form of defence. Edinburgh castle sits on the top of a glacial crag, in an almost perfect position to defend itself, with very little chance for the attackers. In Italy, there are many walled hill-top villages, whilst the Maoris in New Zealand built their settlements (called Pa's) on the top of steep hills to prevent being attacked. The other common natural feature used for defence is water, and in particular rivers. Both Shrewsbury and Durham are very good examples of where a meander of the river has formed an area of land bounded by water on three sides. This provided both cities with excellent defences, as they only had a thin neck of land to defend. The idea of resources covers a huge number of different things. For early settlers the most important resources were fuel, building materialsand food. Settlements grew in areas where wood was plentiful, stone easily accessible and good soil allowed agriculture to be developed. Mining: The coal mines of South Wales, Tin mines of Cornwall and large mining projects as seen at Carajas in Northern Brazil, have all encouraged the rapid growth of settlements aimed at housing the workers and providing them with all that they require. Food: The farming area of East Anglia is one example of how small settlements will locate in areas conducive to good agriculture. Oil: Settlements in Alaska and the Middle East have grown rapidly on the back of the oil industry. Precious metals: Settlements in South Africa have grown after thediscovery of large deposits of precious metals such as gold. The most famous settlement to grow due to finding gold is San Francisco, after the gold rush to California in 1849. Route centres are often called Nodal Points. Anywhere where two routes meet has great potential for settlement. Often these are formed by the meeting of two valleys, but settlement nowadays will grow where two main roads meet. In the UK, York is a good example of a route centre. Birmingham also enjoys a very good location, where many routes join up, and this is one of the reasons for its growth to become one of the largest cities in the UK. Just as water is very important for drinking, fishing, irrigation and navigation, so the ability to cross the rivers is also very important. Many towns and cities have built up at points where it was easiest to cross a large river. Exeter is one such example, crossing the river Exe. However one of the best examples is Paris in France. The original town was based on the tiny Ile dela Cite, which is an island in the middle of the River Seine. This island meant they could build two small bridges across the river rather than one large one. The new settlement also benefited from all the other advantages associated with being beside a river, as well as becoming a route centre due it being one of the only places to cross the river. Nowadays the island has been engulfed by the huge city that Paris has become, however it does still have many bridges going to it and is the point where the huge Notre Dame Cathedral is built. Just as two valleys, or roads, make a nodal point for settlement growth, so do two rivers joining. One such example is found in Khartoum in Sudan, where the Blue and the White Nile meet. The situation of a settlement is the description of the settlement in relation to the other settlements and physical features around it. The situation of a settlement is the most important in determining whether it grows to become a large city or stays as a small town or village. In the UK, Birmingham is an example of a city with an excellent situation. It is located central to the country, with excellent links by road to the North and South to London. As cities begin to fulfil different functions their importance can increase or decrease. Their situation plays an important part in deciding which of these will occur.